I was thinking the other day of how much Amara loves food coloring! We have done numerous science experiments with food coloring and around here a pancake isn’t a pancake if Amara hasn’t colored it some special color – possibly adding colored sprinkles! My friend Debra over at Frugal Little Bungalow suggested that maybe the reason Amara likes food colors so much is because of how much Jenna loves hair color! I thought about it for some time and I think the reason Amara likes food coloring goes back to the days of her first learning to eat different foods. Jenna started adding food coloring to her mashed potatoes. Amara loved blue potatoes! Since I love cooking with her, I have encouraged the food coloring addiction – and the sprinkles! My cupboards are well stocked with both! A couple of weeks ago as she was getting ready for bed she asked if we could have monkey bread for breakfast. I really wasn’t up for making monkey bread so I told her the dough was frozen. When she was younger, that would have worked. This time she comes back with, “Well you could go get it out of the freezer”. I couldn’t argue with her and at point, I didn’t even want to! Now I was looking forward to monkey bread and making it with her! When I returned from getting the dough from the freezer, Amara announced she wanted to make rainbow monkey bread – “we’ll just dye the dough different colors Grandma!” I told her I would think about it and we could discuss it in the morning. We use Bridgeford Ready-Dough frozen dough and I was trying to figure out how we could color the dough and not dye her hands and the counter all at the same time. My idea was to cut the thawed dough into 5 or 6 chunks, put the dough in zip lock bags and add food color! Then she could just squish the color through the dough. This kind of worked and squishing and working the dough is a lot of fun! She cut the colored chunks into small pieces for dipping in butter and then in the sugar cinnamon mixture.That was our next problem – the cinnamon hid the color. Amara declared that, “What the world needs is clear cinnamon – just like we have clear vanilla!” Smart girl! Her colored monkey bread didn’t taste any different from our regular monkey bread, which meant it was awesome and it did look pretty when you pulled it apart! Baking with her sure is fun! We had another fun weekend with Amara. Saturday was her first Cross Country meet. It was 6th, 7th and 8th graders from 6 local schools. This is Santiago’s first Cross Country Meet ever and I have to give a big shout out to their PE couch who organized the Track Team. They meet after school 4 nights a week. Amara loves it and while she didn’t win, she did finish the one-mile race. We had no idea that during the last third of the race she slipped and fell skinning her right knee and elbow. She still finished the race! A few weeks ago, when Amara was over we had a blast doing a strange cooking project that will have to wait for another post. 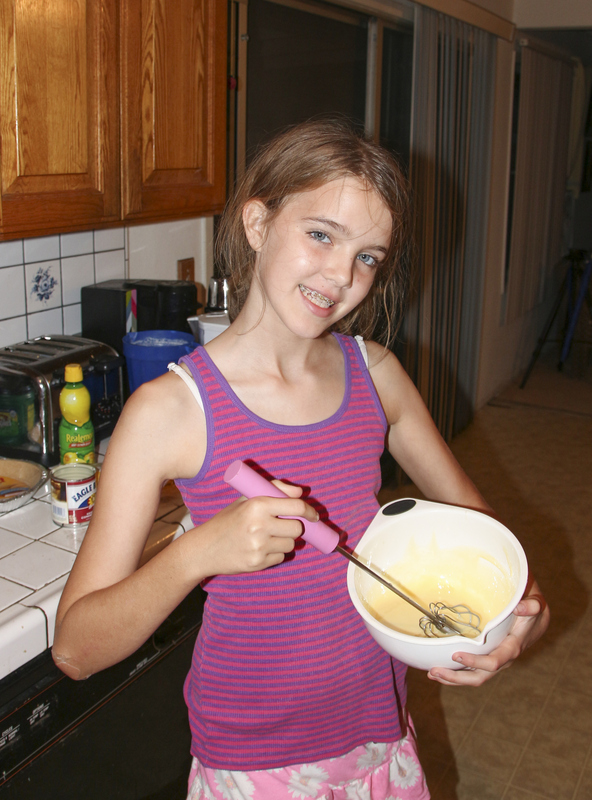 It had been her idea and was so much fun that I told her then to find a recipe for something she wanted to make or bake the next time she came over. She called me about an hour in advance and said she had found the perfect cupcake recipe to make. Since the list of things she needed for these cupcakes was long we decided I should pick her up and take her to the grocery store with me. Shopping with her is always more fun than shopping alone! As we headed home from the store, I told her that we were going to go home and while dinner was cooking, we were going to make a special dessert for Grampy. We would spend the next morning making her cupcakes. Grampy has really been wanting a “lemon ice box pie”. I even got the recipe from his Dad! When we got home, I explained it would be very fast and easy to make as it was just sweetened condensed milk, egg yolks and lemon juice and you don’t even have to bake it. Plus we had bought a pre-made shortbread pie-crust! You just let it set up in the freezer for a few hours. Amara gave me a rather questioning look and said, “I didn’t think you were supposed to eat uncooked eggs, Grandma.” So I sent her to Grampy! I knew he would love explaining to her how the juice cooks the eggs – and he did! We started watching the movie “Tomorrowland” while we dined on chicken strips and fries and waited for our dessert to set up. Amara ate her piece of pie and while it was good, she was convinced she could taste the eggs! Grampy loved the pie and has requested I make it again but this time remember to get the Cool Whip. Amara made it about half way through the movie when she announced she was tired and wanted to go to bed. It really had been a long day. She was up at 7 AM ready to start making her cupcakes! The recipe was for orange, gray and brown cat cupcakes. We didn’t make the gray kitty because I don’t have any black food coloring and we didn’t have very good whiskers because we couldn’t get the right licorice at the grocery store. But the pictures really tell the story. She did all the work I just kept her company and gave advice when asked. It was so much fun and they were very tasty! One of the best parts was when she took the frosting bag and went running into the office and told Grampy to hold his finger out so she could frost it! She also took the little dish of mini M&Ms and gave it to him when she was done. She does love her Grampy! It was another fun weekend! 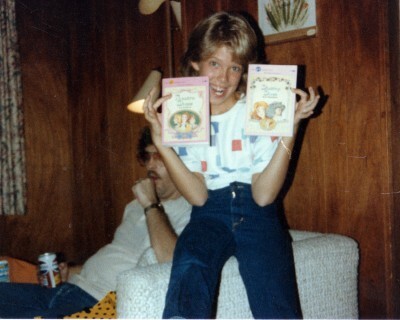 I had just changed out of my Book Fair-ie costume when one of the 1st grade teachers told me how disappointed her class had been that I wasn’t at the Book Fair when they were. No one wants to disappoint 1st graders so I asked her if she wanted me to drop by her classroom the next day. She was happy to take me up on my offer! I love going to the classrooms to visit; I’d had so much fun doing it as The Cat in the Hat. Thinking about that got me wondering, what was I going to say to these 1st graders? When I was The Cat in the Hat, we were delivering books and I had written a long Cat in the Hat type verse for them. What was I going to say? Then I remembered the picture I had used last year in a post about when my parents first knew I was a Book Fair-ie. I printed it 8×10 and I started to think of more things I could add to my back-story! This would be fun. I got to Jenna’s that morning and told her my idea and it was as if a light bulb went off in her head! She was going with me to the classroom and she had the perfect picture. During the week when I was in costume, Jenna had been telling the student in the library that SHE was half Book Fair-ie and she just remembered another picture to go enhance our story. I love that she tells all the students that I am her Mom! Talk about feeling important. Anyway! “Hi Everyone! I am the Book Fair-ie! You’re teacher told me you were disappointed because I wasn’t in the Library when you went to the Book Fair and she asked me to make a special trip back just to visit you! You might be wondering what a Book Fair-ie does. Well, it is my job to go around bopping children on the head with my magic wand to giving them the love to read! Do any of you love to read?” Of course, they all raised their hands. “Then I will just have to wave my wand once over all of you!” I did and they all loved it! 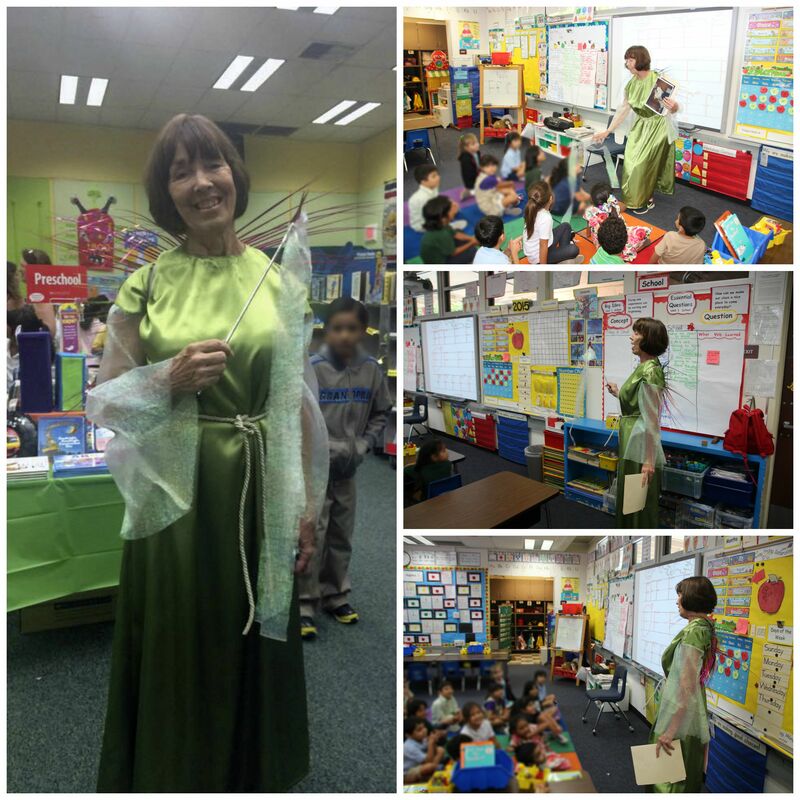 A student asked if I was really a fairy. “Now, do you see the man sitting behind her? 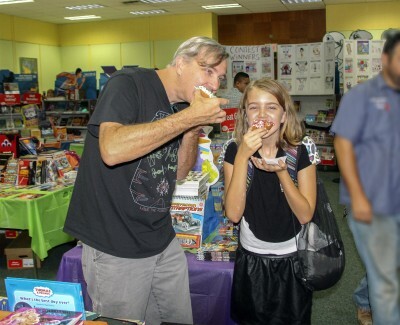 That is Miss Jenna’s Dad and he is definitely NOT a Book Fair-ie! He doesn’t even like to read. Can you imagine that?” They could not! “I get a lot of questions about my beautiful wings.” There were lots of ews and ahs. “Book Fair-ies cannot fly but because we spend so much time reading we have wonderful imaginations. I can just shut my eyes and dream that I am flying anywhere.” I loved it when one of the little boys closed his eyes and said he was flying! Before I left the classroom I made all of them promise me that they would go home and read every day so that they could grow up and be Book Fair-ies, too! After we left the 1st graders, we decided to stop by and visit the PM Kindergartners and we did it all over again! The Kindergartners loved the Book Fair-ie even more! The next morning the AM Kinder teacher told me how disappointed her class was that I never came to see them! I actually thought it was both Kinder classes in one that we had visited. We couldn’t have sad Kinders and so I donned my costume one more time! Last week was the Scholastic Book Fair at Amara’s school. This year the theme was Monsters! I was just in awe of the ideas the Book Fair Chairman came up with and the execution by the team was even more amazing! Lots of meeting and lots of work was done in advance. The signs were everywhere. The Book Fair would officially open on Tuesday. We spent Monday morning setting everything up. The Library Media Center was transformed. The Book Fair Chairman had created a Monster coloring contest for the students and all of the art had been pinned to the wall. It looked amazing and parents and students would have fun trying to find their art. She and another volunteer had also created these amazing Coin Monsters. The idea was you could feed the Coin Monster your change and take a free pencil. The change would go to buy new books for the Library. Jenna had all the volunteers going “num num num” every time someone fed the Monsters. That afternoon the PTA hosted a Teachers Preview. In keeping with the monster them volunteers pitched in to create a Monstrous buffet. I had an absolute blast making Monster sandwiches and a Monster Melon! I have finally gone over to the Dark Side and I spend way to much time on Pinterest but they both turned out so cute! I loved my Monster Melon. The teachers were also served a monster cheese ball, brain and monster cupcakes, chocolate covered monster strawberries, a veggie Monster and so much more. Not to mention the Drink Table complete with Monster Brew Punch and 2 kinds of Monster Mocktails with floating eyeballs! The mom in charge of Teachers Preview decorated the table so cute including some Monster Cookies that her sister had made for the event. The teachers had a wonderful time gathering books to purchase and to add to their wish lists while nibbling and sipping our monstrous refreshments. It was a huge success! I loved getting a chance to be one of the volunteers. I have so much fun spending time with Jenna and the other Moms. I also love being in the Library Media Center when Amara is done with her day. Twice that week she came in after Cross Country was over – all hot from running. She looked so cute and so athletic. 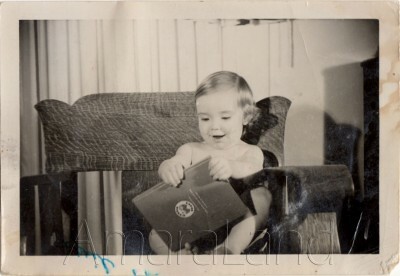 Being there meant Grandma got extra kisses on the cheek – no hugs, as we were both to hot! 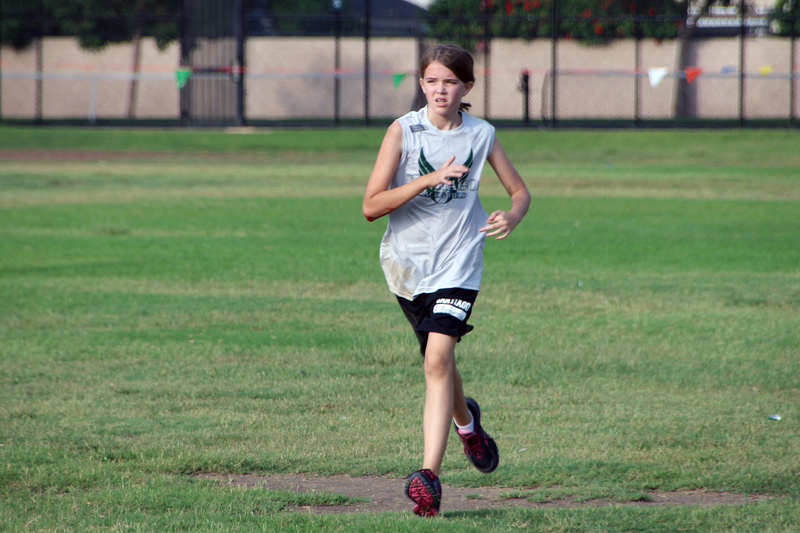 Amara is really enjoying Cross Country. I am so proud of her. The Book Fair runs the week of the Back to School Nights. Now that Amara’s school is K-8 they have to split it up and run it over 2 evenings. I worked one of the registers for the upper grade Back to School night. My plan had been to go back the next night for the lower grade Back to School night dressed as the Book Fair-ie, more to have fun than to work. However, I couldn’t get a parking place within a mile and since I wasn’t actually working, I decided to take the night off and just go home! I had been there that day as the Book Fair-ie and I admit I was exhausted! Donuts for Dads was another first for our Book Fair and we had no idea what to expect. It was Friday morning before school and would culminate the Book Fair. When it was over, we would start tearing everything down. The turnout was overwhelming! There were 6 dozen donuts and there were only three donuts leftover! It was so great to see so many Dads at school and to have them be the ones buying books! We were crazy busy! This is definitely an idea that will be done again! A month or so before the Book Fair I had decided that I wanted to be the Book Fair-ie again. The students love it, especially the lower grades. I also decided that if I wanted to do it I needed a better costume! The wings I had from last year were wonderful but the costume was very cheap and I was afraid if I washed it that it would just fall apart. You could almost see through it too which meant I had to wear clothes underneath so it was very warm! So I set about to sew! I used to love to sew and I used to do it all the time but about 8 years or so ago I just lost interest. Making this costume did not bring that interest back! I joked with Jenna when I was done that the sewing machine had been put away and probably won’t come out again for another 8 years. Sewing wasn’t fun but being the Book Fair-ie certainly was. I will tell you more about that next! It was a wonderful day! For years now, I have wanted to organize a Grandparents event for Amara’s school but I never remembered until it was too late to make it happen. I have also wanted to get other grandparents involved in volunteering by sharing with them how much fun I’ve been having. This year I planned ahead! With the help of some amazing volunteers the Santiago PTA hosted their first ever Grandparents Coffee Break in honor of National Grandparents Day! The plan was to serve coffee and tea and have a dessert bar filled with lots of different yummies all donated by parents! Lots of them homemade, too! I was so worried that we wouldn’t have enough treats. Of course I was equally as worried that no one would show up. Boy was I wrong! Of course, since nothing can ever go off exactly as planned our morning did start with a bit of a glitch. We had told everyone to drop their desserts off in the Media Center during drop off or any time before noon. Jenna and I got to school around 7:15 and walked in to find that it wasn’t set up for our event – it was set up for testing! We both looked at each other and panicked for a minute. OK, I panicked more than she did! Breathe, the testing would be done at 11:30 and we would still have time to get it all set up! Talk about teamwork! We got all the tables moved around and table clothes on; little jelly jars were filled with either Skittle or M&Ms and a bouquet of suckers (Mo’s idea! ); coffee was brewed and the desserts were displayed to look amazing – and we had time to spare! Such a great bunch of Moms. Because we knew we would have many Spanish-speaking grandparents attending, I recruited two bi-lingual volunteers to greet them at the door and to help with any translating. One of them actually worked as our translator for all the speakers. Next time we use microphones but that was about our only problem! And we only needed a microphone because we had so many guests! I was just thrilled when at 12:45 people started arriving! I had created a slideshow of about 900 photos that I had taken over the years. I included a few of grandparents who I knew would be there – how fun to see your picture on the big screen on the stage. The grandparents loved it and you could hear them share with others, “That’s my grandchild!” By the time the guests had all arrived, we had a small house full. I was so happy! Jenna stated the event by wishing all the grandparents a Happy Grandparents Day and talking about the importance of grandparents in children’s lives. She told them about when she was young she had to walk the block to her Grandma’s apartment after school and wait for her Dad or me to pick her up. Grandma made her do her homework. She knows how important Grandmas are! I think she made all of the grandparents there feel important and special. I also had the idea of having a couple of 8th graders talk about what it has been like to go to Santiago since Kindergarten. We had 3 girls tell about their own lives at the school and about how the school has grown and changed. Again, the grandparents really enjoyed it! We had a great talk by the school’s new Principal – who everyone loves! He shared some slides and told of his own journey through school and some of his plans for Santiago. It was great insight for the grandparents who don’t always hear everything that parent’s hear! Then I got to talk! I really wanted these grandparents to understand just how much fun it is to volunteer! I shared with them some of the fun things I got to do last year. Who doesn’t want to dress up as the Cat in the Hat or the Book Fair-ie? I told them how much fun it is to be armed with a squirt bottle during Jog-a-thon or to sell fruit pops on Fridays. I admitted – I just pick the fun jobs! Jenna ended it all by thanking them all for coming and encouraging them to volunteer! But before they could go they needed to get one the to-go boxes we had and fill it with left over desserts! The grandparents all thanked us as they left. We had really made them feel special. They were so impressed that we had done all of this for them. It was the perfect way to end the party! I’ve got lots of new ideas for next year! Last week when Amara was over and we were having fun with our facial masks, she mentioned that she wanted to do make-up. Her Mom had recently given her some old make-up and she had bought a little on her own. 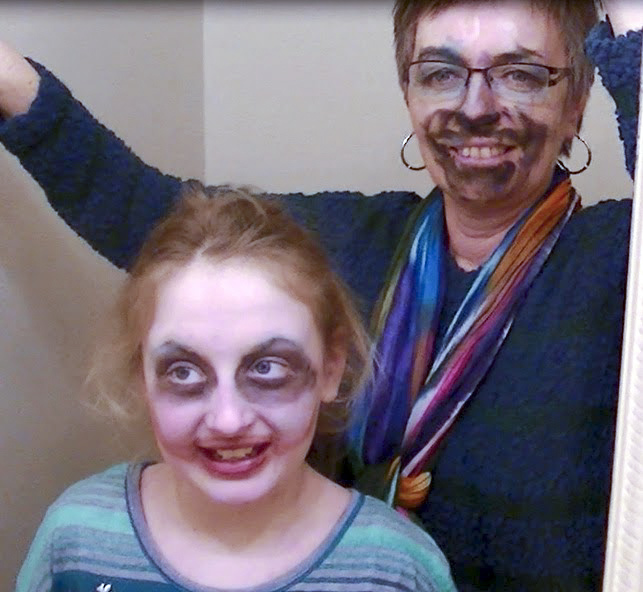 I remembered how much fun Sandy said she had playing make-up with her granddaughter Kendal so I told Amara she should bring her make-up sometime. Well, that sometime was the next time of course! Last week when we had been so disappointed in Amara’s peel off mask, we had gone in search of one of the old kind. We found a cucumber peel off mask at CVS. She had taken one home and I took one home to wait for her next visit. It seemed only right that we should do her facial before doing her make-up. Amara did my make-up too and she did a very nice job, we just never got a picture of me! Once we were done with her make-up, she “chalked” her hair and mine. She then asked if she could chalk Grampy’s hair. He had fun letting her do it and he looked rather good with green and blue hair and a purple beard!